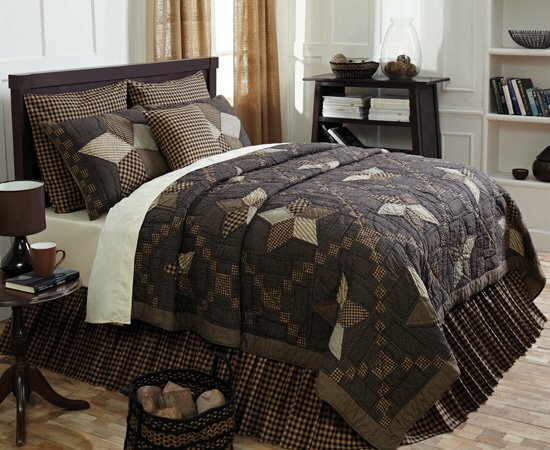 Farmhouse Star Quilt Collection from VHC Brands | P.C. Fallon Co. Traditional country style at its best, this Farmhouse Star collection from VHC Brands features black, brown, cream and ivory fabrics in an eye-catching pattern of hand-stitched patchwork stars. Classic design with quality workmanship are sure to provide years of stylish service from this ensemble. Patchwork 5 point stars are set on a black micro plaid, criss-crossed with a traditional Irish chain in black and khaki check patches. The quilt reverses to a grey and creme ticking stripe. The shams feature a large 5 point star in the center with a checkerboard board. A coordinating euro sham and bedskirt are done in a black and khaki check. The Farmhouse Star collection features bedding, two decorative throws and a shower curtain. All pieces are 100% cotton. All throw pillows include inserts. Shams do not include pillow inserts. From the Lasting Impressions line by VHC. Free shipping on all orders over $89. The Black Check Fabric Euro Sham measures 26" x 26". The euro sham is a black and khaki check 100% cotton fabric. On the back of the sham is the same check with a 3-tie closure and a 3" overlap to conceal a pillow insert. Pillow filler sold separately. (Photographed filled). The euro sham is designed to be used behind a standard sham. This item is imported. Please note, colors may appear differently in different resolutions and on different computers. From The Ashton & Willow Line made by VHC Brands. Manufacturer's UPC code is 840528112041. The Black Check Twin Bedskirt measures 39"W x 76"L with a 16" drop. The Black Check collection has a black and khaki traditional check. Both the skirt and the white decking are 100% cotton fabric. Ruffle ratio is 1:1.2 x deck length on 3 sides, gathered. Front skirt panel overlaps side panel 2.5" at front corners. This item is imported. Please note, colors may appear differently in different resolutions and on different computers. From The Ashton & Willow Line made by VHC Brands. Manufacturer's UPC code is 840528112089. The Black Check Queen Bedskirt measures 60"W x 80"L with a 16" drop. The Black Check collection has a black and khaki traditional check. Both the skirt and the white decking are 100% cotton fabric. Ruffle ratio is 1:1.2 x deck length on 3 sides, gathered. Front skirt panel overlaps side panel 2.5" at front corners. This item is imported. Please note, colors may appear differently in different resolutions and on different computers. From The Ashton & Willow Line made by VHC Brands. Manufacturer's UPC code is 840528112072. The Black Check King Bedskirt measures 78"W x 80"L with a 16" drop. The Black Check collection has a black and khaki traditional check. Both the skirt and the white decking are 100% cotton fabric. Ruffle ratio is 1:1.2 x deck length on 3 sides, gathered. Front skirt panel overlaps side panel 2.5" at front corners. This item is imported. Please note, colors may appear differently in different resolutions and on different computers. From The Ashton & Willow Line made by VHC Brands. Manufacturer's UPC code is 840528112065. This Farmhouse Star Quilted Pillow features a patchwork 5-point star on black, tan and dark creme ground with edges finished in a bias cut black and tan micro check fabric. It has a 100% cotton shell, is machine pieced and hand-quilted. Reverses to charcoal on dark creme ground ticking stripe fabric with 2-button closure. 100% cotton batting. Pillow fill is 100% polyester. 16" x 16". This item is imported. Please note, colors may appear differently in different resolutions and on different computers. From The Victorian Heart Collection made by VHC Brands. Manufacturer's UPC code is 840528153037. The Farmhouse Jute Rug Half Circle Stencil Stars is made of natural fiber jute in a half circle design featuring hand stenciled stars. The natural undyed jute is braided with black dyed jute in a simple primitive country pattern. Measures 16.5" length at center x 33" wide. 100% braided jute. Spot clean only. This item is imported. Please note, colors may appear differently in different resolutions and on different computers. Made by VHC Brands. Manufacturer's UPC code is 841985000896. The Farmhouse Jute Rug Oval 20x30 is made of natural fiber jute. The natural undyed jute is braided with black dyed jute in a simple primitive country pattern. Measures 20" x 30". 100% braided jute. Spot clean only. This item is imported. Please note, colors may appear differently in different resolutions and on different computers. Made by VHC Brands. Manufacturer's UPC code is 841985084513. The Farmhouse Jute Rug Oval Stencil Stars 20x30 is made of natural fiber jute and features three hand stenciled stars in the middle. Surrounding the center stars, the natural undyed jute is braided with black dyed jute in a simple primitive country pattern. Measures 20" x 30". 100% braided jute. Spot clean only. This item is imported. Please note, colors may appear differently in different resolutions and on different computers. Made by VHC Brands. Manufacturer's UPC code is 841985000865. The Farmhouse Jute Rug Oval Stencil Welcome 20x30 is made of natural fiber jute. A center oval in natural tan jute is hand stenciled with three stars and the word Welcome. The natural undyed jute is braided with black dyed jute in a simple primitive country pattern that borders the center stencil design. Measures 20" x 30". 100% braided jute. Spot clean only. This item is imported. Please note, colors may appear differently in different resolutions and on different computers. Made by VHC Brands. Manufacturer's UPC code is 841985000902. The Farmhouse Jute Rug Oval Stencil Welcome Y'all 20x30 is made of natural fiber jute. A center oval in natural tan jute is hand stenciled with the words Welcome Y'all. The natural undyed jute is braided with black dyed jute in a simple primitive country pattern that borders the center stencil design. Measures 20" x 30". 100% braided jute. Spot clean only. This item is imported. Please note, colors may appear differently in different resolutions and on different computers. Made by VHC Brands. Manufacturer's UPC code is 841985010154. The Farmhouse Jute Rug Rectangular 20x30 is made of natural fiber jute. The natural undyed jute is braided with black dyed jute in a simple primitive country pattern. Measures 20" x 30". 100% braided jute. Spot clean only. This item is imported. Please note, colors may appear differently in different resolutions and on different computers. Made by VHC Brands. Manufacturer's UPC code is 841985084520. The Farmhouse Jute Rug Rectangular Stencil Welcome 20x30 is made of natural fiber jute. A center oval in natural tan jute is hand stenciled with three stars and the word Welcome. The natural undyed jute is braided with black dyed jute in a simple primitive country pattern that borders the center stencil design. Measures 20" x 30". 100% braided jute. Spot clean only. This item is imported. Please note, colors may appear differently in different resolutions and on different computers. Made by VHC Brands. Manufacturer's UPC code is 841985000919. The Farmhouse Jute Rug Oval 24x36 is made of natural fiber jute. The natural undyed jute is braided with black dyed jute in a simple primitive country pattern. Measures 24" x 36". 100% braided jute. Spot clean only. This item is imported. Please note, colors may appear differently in different resolutions and on different computers. Made by VHC Brands. Manufacturer's UPC code is 841985084537. The Farmhouse Jute Rug Oval Stencil Stars 24x36 is made of natural fiber jute and features three hand stenciled stars in the middle. Surrounding the center stars, the natural undyed jute is braided with black dyed jute in a simple primitive country pattern. Measures 24" x 36". 100% braided jute. Spot clean only. This item is imported. Please note, colors may appear differently in different resolutions and on different computers. Made by VHC Brands. Manufacturer's UPC code is 841985000872. The Farmhouse Jute Rug Rectangular 24x36 is made of natural fiber jute. The natural undyed jute is braided with black dyed jute in a simple primitive country pattern. Measures 24" x 36". 100% braided jute. Spot clean only. This item is imported. Please note, colors may appear differently in different resolutions and on different computers. Made by VHC Brands. Manufacturer's UPC code is 841985010284. The Farmhouse Jute Rug Rectangular Stencil Stars 24x36 is made of natural fiber jute and features three hand stenciled stars in the middle. Surrounding the center stars, the natural undyed jute is braided with black dyed jute in a simple primitive country pattern. Measures 24" x 36". 100% braided jute. Spot clean only. This item is imported. Please note, colors may appear differently in different resolutions and on different computers. Made by VHC Brands. Manufacturer's UPC code is 841985010185. The Farmhouse Jute Rug Oval 27x48 is made of natural fiber jute. The natural undyed jute is braided with black dyed jute in a simple primitive country pattern. Measures 27" x 48". 100% braided jute. Spot clean only. This item is imported. Please note, colors may appear differently in different resolutions and on different computers. Made by VHC Brands. Manufacturer's UPC code is 841985084544. The Farmhouse Jute Rug Oval Stencil Stars 27x48 is made of natural fiber jute and features three hand stenciled stars in the middle. Surrounding the center stars, the natural undyed jute is braided with black dyed jute in a simple primitive country pattern. Measures 27" x 48". 100% braided jute. Spot clean only. This item is imported. Please note, colors may appear differently in different resolutions and on different computers. Made by VHC Brands. Manufacturer's UPC code is 841985010192. The Farmhouse Jute Rug Rectangular 27x48 is made of natural fiber jute. The natural undyed jute is braided with black dyed jute in a simple primitive country pattern. Measures 27" x 48". 100% braided jute. Spot clean only. This item is imported. Please note, colors may appear differently in different resolutions and on different computers. Made by VHC Brands. Manufacturer's UPC code is 841985084551. The Farmhouse Jute Rug Rectangular Stencil Stars 27x48 is made of natural fiber jute and features three hand stenciled stars in the middle. Surrounding the center stars, the natural undyed jute is braided with black dyed jute in a simple primitive country pattern. Measures 27" x 48". 100% braided jute. Spot clean only. This item is imported. Please note, colors may appear differently in different resolutions and on different computers. Made by VHC Brands. Manufacturer's UPC code is 841985010208. The Farmhouse Jute Rug Oval 36x60 is made of natural fiber jute. The natural undyed jute is braided with black dyed jute in a simple primitive country pattern. Measures 36" x 60". 100% braided jute. Spot clean only. This item is imported. Please note, colors may appear differently in different resolutions and on different computers. Made by VHC Brands. Manufacturer's UPC code is 841985084568. The Farmhouse Jute Rug Oval Stencil Stars 36x60 is made of natural fiber jute. Natural undyed jute is braided with black dyed jute in a simple primitive country pattern in the middle. A band of natural tan jute with hand stenciled stars surrounds the center braided bands. Another band of braided tan and black borders the rug. Measures 36" x 60". 100% braided jute. Spot clean only. This item is imported. Please note, colors may appear differently in different resolutions and on different computers. Made by VHC Brands. Manufacturer's UPC code is 841985010215. The Farmhouse Jute Rug Rectangular Stencil Stars 36x60 is made of natural fiber jute. Natural undyed jute is braided with black dyed jute in a simple primitive country pattern in the middle. A band of natural tan jute with hand stenciled stars surrounds the center braided bands. Another band of braided tan and black borders the rug. Measures 36" x 60". 100% braided jute. Spot clean only. This item is imported. Please note, colors may appear differently in different resolutions and on different computers. Made by VHC Brands. Manufacturer's UPC code is 841985010222. The Farmhouse Jute Rug Oval 60x96 is made of natural fiber jute. The natural undyed jute is braided with black dyed jute in a simple primitive country pattern. Measures 60" x 96". 100% braided jute. Spot clean only. This item is imported. Please note, colors may appear differently in different resolutions and on different computers. Made by VHC Brands. Manufacturer's UPC code is 841985010338. The Farmhouse Jute Rug Rectangular 60x96 is made of natural fiber jute. The natural undyed jute is braided with black dyed jute in a simple primitive country pattern. Measures 60" x 96". 100% braided jute. Spot clean only. This item is imported. Please note, colors may appear differently in different resolutions and on different computers. Made by VHC Brands. Manufacturer's UPC code is 841985010345.